The Impatiens pattern provides enough papers to make (4) five-petal flowers. We are excited to release our first ever designs that include the quilting design on newsprint, right in the pattern for you to trace onto your finished petals! Digitized options will be available for download, sold separately. Additionally, this pattern will include a scannable link directly to a video of Judy showing the technique for applying the binding! 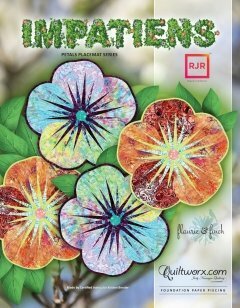 The pattern is both Fat Quarter and Yardage friendly, giving you the options to get as colorful as you like with your petals! Finally, the pattern includes a package of (4) Stitch-N-Peel Flower Centers for a perfectly sized applique center every time!